Radiation therapy (RT) is widely used for cancer treatment, alone or in combination with other therapies. Recent RT advances have revived interest in delivering higher dose in fewer fractions, which may invoke both cellular and microvascular damage mechanisms. Microvasculature may thus be a potentially sensitive functional biomarker of RT early response, especially for such emerging RT treatments. However it is difficult to measure directly and non-invasively, and its time course, dose dependencies, and overall importance in tumor control are unclear. 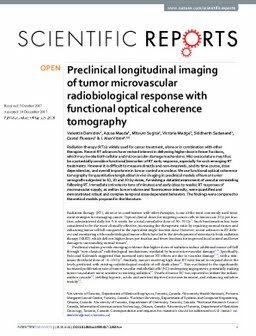 We use functional optical coherence tomography for quantitative longitudinal in vivo imaging in preclinical models of human tumor xenografts subjected to 10, 20 and 30 Gy doses, furnishing a detailed assessment of vascular remodeling following RT. Immediate (minutes to tens of minutes) and early (days to weeks) RT responses of microvascular supply, as well as tumor volume and fluorescence intensity, were quantified and demonstrated robust and complex temporal dose-dependent behaviors. The findings were compared to theoretical models proposed in the literature.